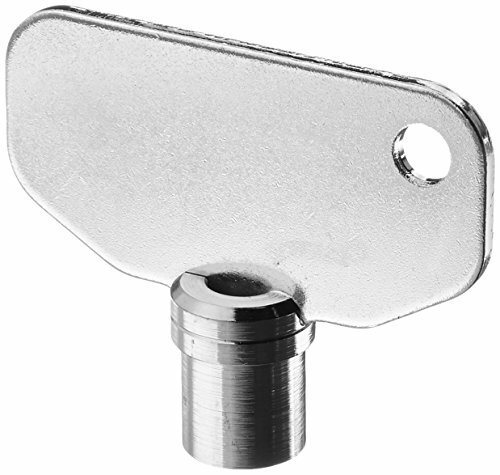 Southco large compression latch tubular key. Made of steel. Nickel plated finish. Measures 1-35/64-inches length by 1-31/32-inches width. 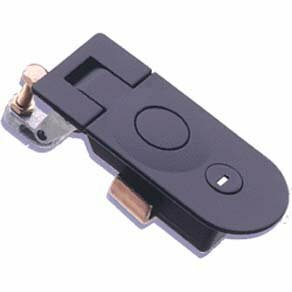 Southco adjustable lever compression latch with raised trigger. 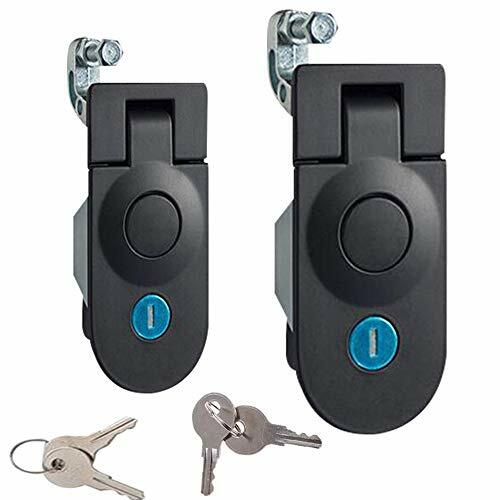 Easy to install, and easy to operate, these popular low-profile lever latches present a sleek look for highly visible installations. A discretely mounted trigger mechanism is provided to release the built-in handle for use. Compressive action pulls door tight, without rubbing action and without wear on latch contact point or frame. A broad grip provides for easy grip adjustment to accommodate grip changes over time. Flush trigger models present smoothest door surface, and greater economy where key- or tool-restricted access is not required. Raised trigger models provide enhanced ergonomics and the enhanced security of keylock or tool access where required. Maximum recommended pawl load (in closed position) 1100N. Industry applications includes automotive/trucks, construction equipment, off-highway vehicles, farm equipment, electronic enclosures, exhibits/signs, food equipment, HVAC, industrial enclosures, industrial machinery, machine tools and metal cutting, lawn/garden equipment, marine, networking, railway, telecommunications, vending machines. Serrated mounting screw: M5 x 16. Head style: Raised trigger. Profile: Flush. Hand operated. Latch assembled: No. Tool access styles for raised trigger models include shutter locking, 7-millimeters square, 4-millimeters hex recess, number 2 Phillips recess, or railway standard 7.5-millimeters tapered square recess. 0.20-inches door thickness. 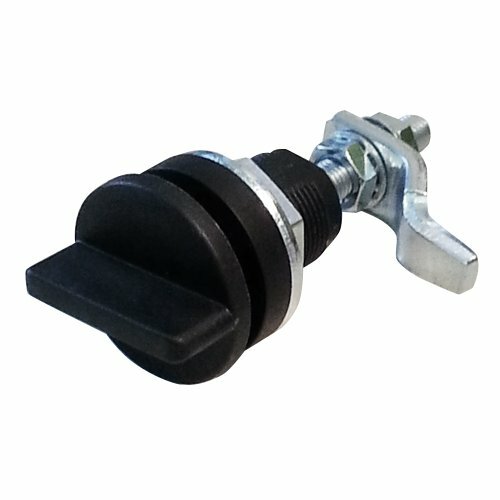 Southco adjustable lever compression latch with raised trigger. Easy to install, and easy to operate, these popular low-profile lever latches present a sleek look for highly visible installations. Maximum recommended pawl load (in closed position) 1100N. Industry applications includes automotive/trucks, construction equipment, off-highway vehicles, farm equipment, electronic Enclosures, exhibits/signs, food equipment, HVAC, industrial Enclosures, industrial machinery, machine tools and metal cutting, lawn/garden equipment, marine, networking, railway, telecommunications, vending machines. Serrated mounting screw: M5 x 16. Head style: raised trigger. Profile: flush. Hand operated. Tool access styles for raised trigger models include shutter locking, 7-millimeters square, 4-millimeters hex recess, number 2 Phillips recess, or railway standard 7.5-Millimeters tapered square recess. 0.20-Inches door thickness. Southco Vise Action compression latches with gaskets. Designed for quick, secure closure in applications where vibration, sealing, and quality are paramount. The smooth operation of the Vise Action design aligns the pawl behind the frame and draws it up tight with a single continuous half-turn motion. Its compression action provides consistent 0.25-inches pull-up for environmental sealing in gasketed applications, and helps reduce or eliminate noise and rattles caused by vibration. Over-center latching resists accidental opening due to shock or vibration. These styles restrict access and discourage vandalism. Gasketed models satisfy NEMA 4 and IP-65 applications. Available for EMI/RFI sealing. Industry applications includes rail, aerospace, bus and coach, specialty vehicle. Tool access restriction. Standard profile. Large size series. Latch assembled: no. Lift handle to relax compression and then turn to open. 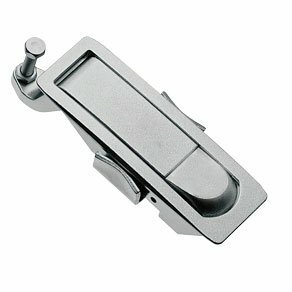 Handle and sleeve die cast zinc with either polished chrome, brushed chrome or black powder coat finish. Stainless steel spring and long pin. Other parts are zinc plated steel. Provides consistent compression. Positioning pin assures proper latching. Maximum panel thickness .234". Provides Consistent Compression. Positioning Pin Assures Proper Latching. 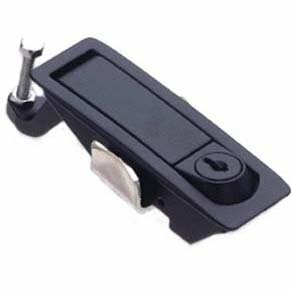 Southco c2-32-15 Series powder coated zinc alloy adjustable lever hand operated compression latch with raised trigger, non-locking, 0.20 inch thick, 0.04"-0.94" grip range, black. 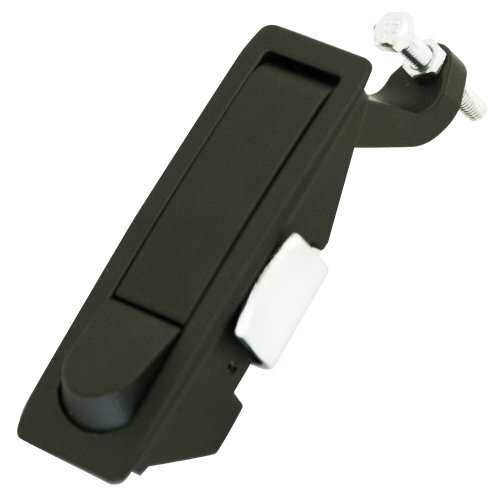 Southco adjustable lever compression latch with raised trigger. A discretely mounted trigger mechanism is provided to release the built-in handle for use. Compressive action pulls door tight, without rubbing action and without wear on latch contact point or frame. A broad grip provides for easy grip adjustment to accommodate grip changes over time. Maximum recommended pawl load (in closed position) 1100N. Industry applications includes automotive/trucks, construction equipment, off-highway vehicles, farm equipment, electronic Enclosures, exhibits/signs, food equipment, HVAC, industrial Enclosures, industrial machinery, machine tools and metal cutting, lawn/garden equipment, marine, networking, railway, telecommunications, vending machines. Serrated mounting screw: M5 x 16. Head style: raised trigger. Profile: flush. Hand operated. 0.20-Inches door thickness. 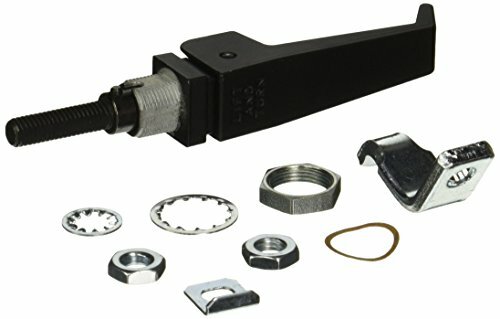 Southco E3-11-15 Series Vise Action Powder Coated Zinc Alloy Hand Operated Compression Latch with T-Handle Head, Non-Locking, 0.71" Thick, 0.45"-1.07"/2.61"-3"
Southco Vise Action compression latches with gaskets. Designed for quick, secure closure in applications where vibration, sealing, and quality are paramount. The smooth operation of the Vise Action design aligns the pawl behind the frame and draws it up tight with a single continuous half-turn motion. Its compression action provides consistent 0.25-inches pull-up for environmental sealing in gasketed applications, and helps reduce or eliminate noise and rattles caused by vibration. Over-center latching resists accidental opening due to shock or vibration. These styles restrict access and discourage vandalism. Gasketed models satisfy NEMA 4 and IP-65 applications. Available for EMI/RFI sealing. Industry applications includes rail, aerospace, bus and coach, specialty vehicle. No access restriction. Standard profile. Large size series. Latch assembled: no. 0.71-inches door thickness. 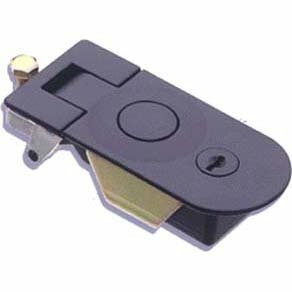 Southco adjustable lever compression latch with raised trigger. Easy to install, and easy to operate, these popular low-profile lever latches present a sleek look for highly visible installations. A discretely mounted trigger mechanism is provided to release the built-in handle for use. 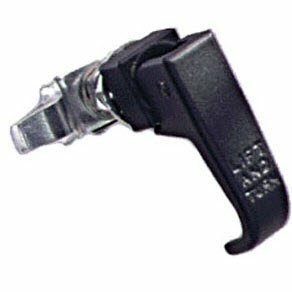 Compressive action pulls door tight, without rubbing action and without wear on latch contact point or frame. A broad grip provides for easy grip adjustment to accommodate grip changes over time. Flush trigger models present smoothest door surface, and greater economy where key- or tool-restricted access is not required. 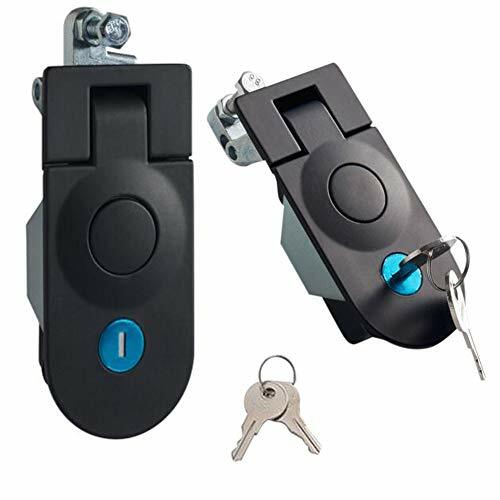 Raised trigger models provide enhanced ergonomics and the enhanced security of keylock or tool access where required. Maximum recommended pawl load (in closed position) 1100N. Industry applications includes automotive/trucks, construction equipment, off-highway vehicles, farm equipment, electronic enclosures, exhibits/signs, food equipment, HVAC, industrial enclosures, industrial machinery, machine tools and metal cutting, lawn/garden equipment, marine, networking, railway, telecommunications, vending machines. Serrated mounting screw: M5 x 16. Head style: Raised trigger. Profile: Flush. Hand operated. Tool access styles for raised trigger models include shutter locking, 7-millimeters square, 4-millimeters hex recess, number 2 Phillips recess, or railway standard 7.5-millimeters tapered square recess. 0.20-inches door thickness. 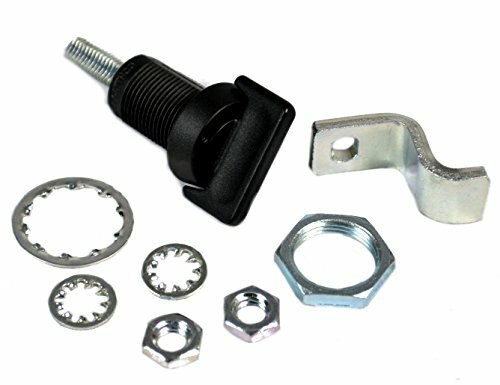 Threaded adjusting screw and jam nut make it easy to provide necessary grip adjustments over time. Installs easily in single rectangular hole. Push-button release pops handle up for convenient use. Mounting hardware accommodates a wide variety of door thickness. Standard size series. 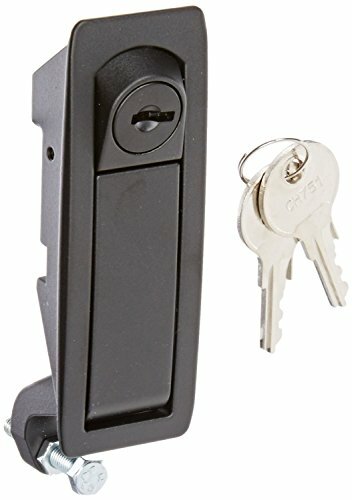 locking without dust shutter. 0.04-0.8-inches door thickness. Die cast zinc with stainless steel springs and roll pins. Available in textured chrome or matte black powder coat. Working load 300 lbs. Ultimate load 488 lbs. M5 screws with lock washer supplied. Single hole installation. Southco Vise Action compression latches with gaskets. Designed for quick, secure closure in applications where vibration, sealing, and quality are paramount. The smooth operation of the Vise Action design aligns the pawl behind the frame and draws it up tight with a single continuous half-turn motion. Its compression action provides consistent 0.25-inches pull-up for environmental sealing in gasketed applications, and helps reduce or eliminate noise and rattles caused by vibration. Over-center latching resists accidental opening due to shock or vibration. 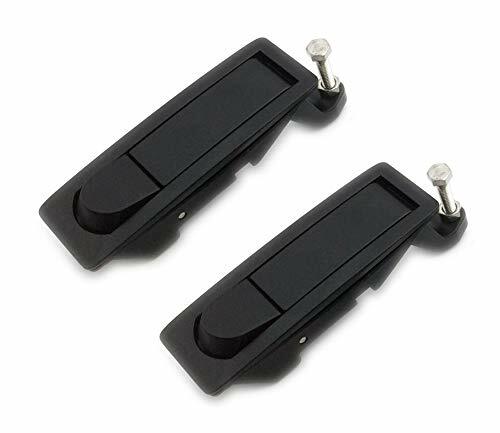 Easy-to-grip knob and handle-actuated styles provide quick, simple access. These styles restrict access and discourage vandalism. Gasketed models satisfy NEMA 4 and IP-65 applications. Available for EMI/RFI sealing. Industry applications includes rail, aerospace, bus and coach, specialty vehicle. Handle/knob profile. Latch assembled: no. 0.71-inches door thickness. Easy to install. Locks door then pulls them tight with one half turn. Internal O-ring gasket provides consistent compression. Maximum working load 100 lbs. 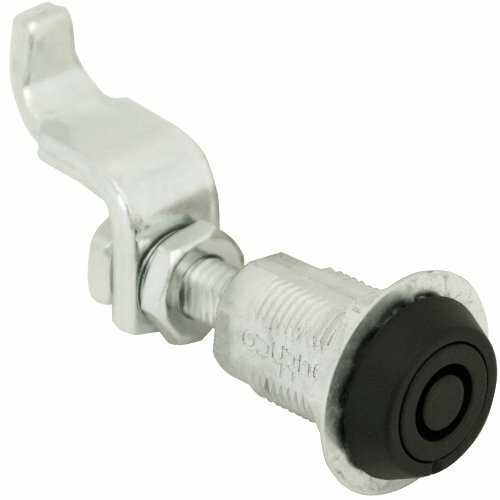 Black polyester coated die cast zinc housing with black knobs or caps. Easy to install. Key must be ordered separately for key operated style.